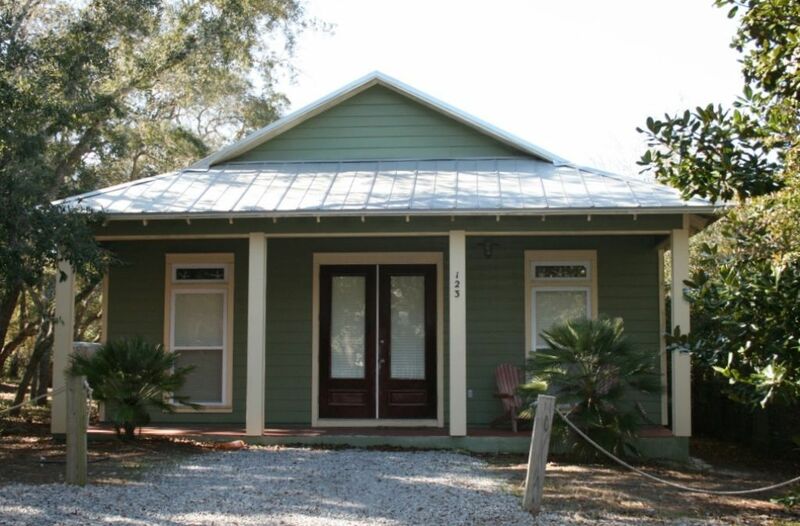 If you are lucky enough to be at the beach, lets hope you are “Lucky Enough” to have found this wonderful, beach cottage tucked away beside Seaside in Old Seagrove Beach. This 3 bedroom 3 bath home is ideal for your family getaway with everything on one level and a large great room where everyone can gather at the end of the day! Beautifully decorated and spaciously designed to provide comfortable accommodations for everyone. Private pool and screened porch maximize your ability to enjoy the outdoors as well. Inviting front porch has 2 Adirondacks. Beautiful hardwood floors grace the entire home. As you enter the home you are in the large great room outfitted with queen sleeper sofa, 2 comfy side chairs, one with ottoman, coffee table, 2 lamps, side table, buffet, built-in shelving which houses an LCD TV, DVD, stereo, books and puzzles. Dining table seats 6. Breakfast bar has 4 barstools at island. Fully stocked kitchen has granite countertops, fridge with icemaker, dishwasher, microwave and glass top range. In the hall closet, there are some chairs and toys for the beach. Super capacity washer and dryer in another hall closet. Bedrooms line the central hallway. Bunk bedroom has bunk with 2 twins, queen bed, armoire with TV and DVD, closet, side table, lamp and private bath with shower and pedestal sink. Queen bedroom has queen bed, bedside table, lamp, chest of drawers, TV, DVD, closet, door to adjacent hall bath, and French doors to the screened porch. Master bedroom has iron king bed, 2 bedside tables, 2 lamps, chest of drawers, armoire with TV and DVD, his / hers closets and French doors to the screened porch. Private master bath has 2 pedestal sinks, jetted tub, and walk-in shower. Hall bath has tub / shower and pedestal sink. Screened porch runs the entire width of the house and overlooks the pool. It has an outdoor dining table with bench plus 4 chairs, 2 rockers, 2 comfortable cushioned teak chairs, 2 side tables and 2 additional chairs. Private pool is 9 x 24 and has two loungers plus a charcoal grill. (Pool is not heated.) Outside shower. Easy beach access straight down the street about 2 minutes away. Parking for 3 cars on the gravel driveway. Seaside is an easy 2 block walk. Fabulous house! Way better in person than pictures! We will definitely be back. A wonderful place located perfectly in the sweet area of Old Seagrove! Our family was beyond lucky to spend our last days of summer vacation here. The pool was perfect for the kids and the bedrooms were all comfy and accommodating. We especially loved that each bedroom has its own private bath. The kitchen was perfectly stocked with the tools we needed to grill and cook during our stay. We will be returning to this precious little green gem!! This property is a great location for families. The beach access is a very short walk (1.5 blocks). The beach at this access was not as crowded as other areas in Seagrove and Seaside. All the amenities of Seaside are a short walk away without the high rent and fees that come with staying in Seaside. The house had plenty of room for 4 adults and 4 children. The tall ceilings are nice. Only suggestion is to add some landscaping (pine straw or mulch) and pavers around the house to keep the dirt and debris from all the trees and shrubs out of the house and pool. Charming beach house in a great location. We enjoyed our stay at “Lucky Enough”. Perfect screened porch to cool off after a day at the beach. The layout works great with all 3 bedrooms having a private bathroom. This lovely house was exactly as described and the location was amazing - close to the beach and Seaside. We did not do a lot of cooking so I can't comment on the kitchen but for our general use, there was nothing that we lacked during our stay. Sunburst is very attentive and the house was well appointed and clean upon arrival. We mainly went to the beach and road our bikes all over Old Seagrove and Seaside. I would highly recommend this property. We appreciate you sharing your vacation experience at Lucky Enough in Old Seagrove near Seaside. Like you, our Guests have really enjoyed the ambience of the overhanging Oak trees and unpaved roads of Old Seagrove with it's easy access to the Beach, Gulf of Mexico and the shops and restaurants of Seaside. Also, the Beach Gear credit you get when you rent form us is handy to use for bikes and beach chairs. We are gratified that your family enjoyed your stay. Thanks for choosing Sunburst Beach Vacations as your management company for your stay on Scenic 30-A.